Brylee- Square Print Bangle Set Only $14.95! You are here: Home / Great Deals / Brylee- Square Print Bangle Set Only $14.95! This set of 8 colorful & gold metal, stamped bangle bracelets featuring a square print detailing is available in 5 colors. 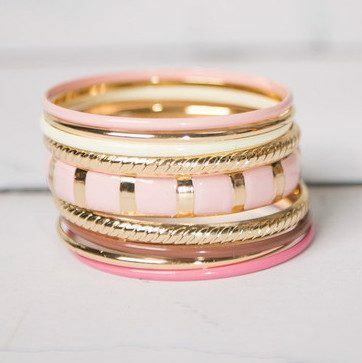 The Brylee- Square Print Bangle Set is Only $14.95! So cute! Find many other great fashions items at Cents of Style!